What is the dominant business model in the 21st Century? — Beam Inc.
What is the dominant business model in the 21st Century? 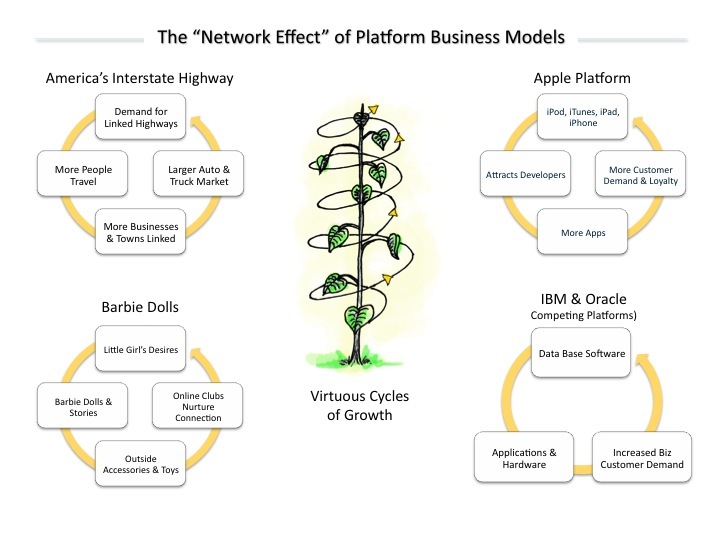 If you answered “the platform business model”, you’d be right. Before we start talking about platforms, let’s look at business models. It is now well understood that the competition today is NOT between products and services but between business models. We have been witnessing this sea change over the last couple of decades. The companies that are winning the race for customers are the ones who have built the better business model. It is the business model that makes them distinct when products come and go. Look at any list of top performing companies in any industry and you will see that the ones with the more compelling, distinct and effective business models ride the top waves of market capitalization … Apple, Amazon, Google, P&G, GE, etc. They all have superior business models and most of them have or are creating superior platform business models. IBM and the computer industry is a good example of this progression. At first it was all about the computer boxes and then add-ons (graphic interfaces, peripherals, software) and then it moved into the solutions space. In fact, IBM sold off its personal computing business to Lenovo Group, a Chinese vendor, and focused on its “Solutions for a Small Planet”. It is a now a tech, consulting solutions company. By the way, this progression is not just for tech companies. We have worked with two large apparel companies that shifted their business models from a focus on clothing products to ‘wardrobe solutions’ when they realized the growth potential of a solutions based business model. The solutions-based business model works because that is really what people want. They don’t want things, they want solutions that enrich their lives. But as you can see from the graphic above, there is another level beyond Solutions—the Platform. The platform business model takes the solutions model and turbo charges it. It creates virtuous cycles of exponential growth. For example, IBM is taking its database software solutions, opening it up for developers of applications and hardware that make the solutions even more valuable, and this in turn attracts more customers making the solution even more valuable and on, and on, and on. Apple creates the same virtuous cycle with its iPhone/iPad/iPod platform. The cool products attract more developers who create more apps, which makes the Apple product solutions even more attractive to the customers, who buy more Apple products … on and on. Barbie dolls, Google, Facebook, etc. all do the same thing. The question for any enterprise today is … How can I create a solutions-based, platform enhancing business model for my business? Breakdown to Breakthrough — Your Key to Future Success?